Hitler's aide-de-camp congratulates Magda Goebbels on her wedding anniversary and remembers how the Führer had brought her together with Goebbels. The Minister of Propaganda arrives and Florian begs him to protect Judith. However Goebbels is too annoyed and jealous of his wife's behaviour. He finally throws everyone out in order to rehearse his big speech. 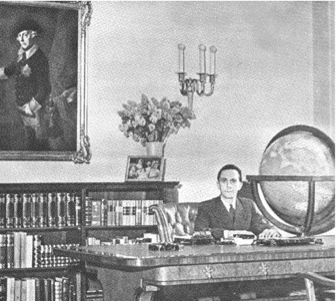 Goebbels at his office with a portrait of Fredric I of Preussia and a wast globe.